That’s right, the next 12 months from now will bring in a minimum of $12,000 in dividend income ($1,000 a month)! That’s without any raises or new contributions. My goal was to reach $12,000 in forward dividends this spring. I broke through the mark earlier this month and am just posting now. I originally started a dividend growth strategy at the beginning of 2012. There have been some ups and downs with personal challenges getting in the way but I’m back on track. I can really feel the compounding working its magic. I’m increasing my income level at a much faster pace organically without even making contributions due to dividend increases and a constantly growing portfolio. My snowball is in motion and keeps growing and increasing speed every day! My goal for the year is to break through the $13,000 level and I’m well on my way with the total at $12,400 currently. That’s a great milestone to achieve. Congrats. Getting to $1k/month is also my next long term goal. Still off fo now but hope to get there in a year or two. Nice ring to $1k/month. WHOA! I think and am hoping I can cross that by the end of the year. You definitely reached that goal quicker than I will have done it. Big congrats, compounding is amazing and that’s a pure force to be reckoned with! YES!! Congrats AAI. That is an amazing accomplishment. 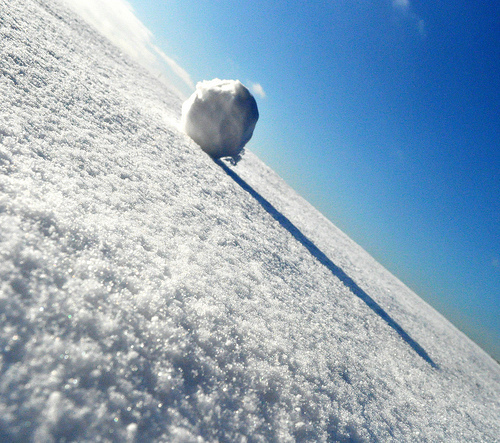 You picture of the snowball sums it all up pretty darn well. Seeing these kind of results are very exciting/motivating for someone like me who still has a long, long way to go to reach this mark. Keep up the great work and keep on pushing yourself to new heights. Congratulations on reaching $1k per month… great milestone! What’s cool about substantial dividends like that is you can reinvest them, and so grow your portfolio AND dividend income even faster! Take care and happy investing! $1K per month from dividends is fantastic! Congrats! Awesome achievement! The snowball just got bigger and it’s only a beginning. Comgrats!! That’s impressive! Nothing like seeing the study stream of growing income! I love watching my dividend income strains grow every month. That is a milestone for sure and an impressive one to say the least. I am almost halfway there hopefully within 4 years or sooner. Congrats! That is amazing. That is what every dividend investor strives for. A four figure month consistently. I am still working on three digit months myself and will take some time, but hope to see this one day. Even better the growth you are getting just by compounding dividends alone without new contributions. You can just speed it up even more with more quality buys throughout the year. Keep it up!